On the Trans-Canada Highway east of Winnipeg, there is a sign just past Deacon’s Corner that gives the distance in kilometers to Falcon Lake and Kenora. 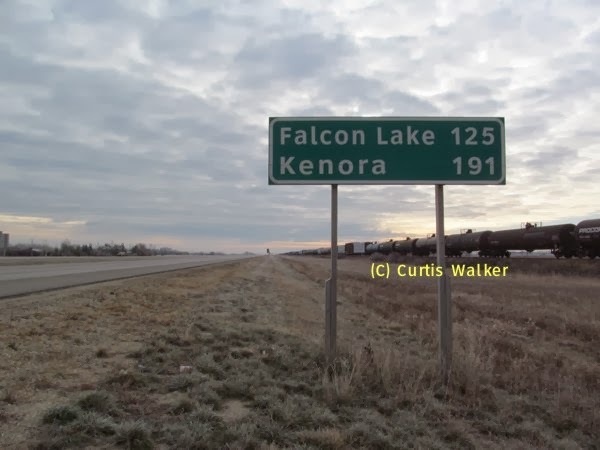 In many respects, it is a sign not unlike many others in the province that gives motorists an idea how far it is to their destination. This one, however, has a sordid tale behind it. After the Metric system was imposed upon the Canadian people during Pierre Trudeau’s autocratic reign as the country’s heavy-handed, supreme ruler, many of these signs around the province were changed to reflect the distances in kilometers instead of miles. This particular sign, likely an original of the Metric era, had served motorists well for many years. Though the posts and perhaps the brackets that were holding it up had seen better days, despite its age, the metal sign itself looked no worse for the wear. However, someone at Manitoba Infrastructure and Transportation still decided that it needed to be replaced. The reasons for this decision escape me. Two years ago, as part of the much-needed resurfacing of this stretch of highway, this new sign made its unceremonious debut. 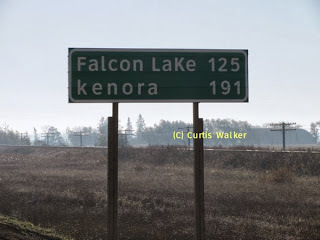 Not only had Kenora apparently moved two kilometers closer, the first letter of Kenora had been spelled with a small “k” and the “k” in Falcon Lake had been capitalized. 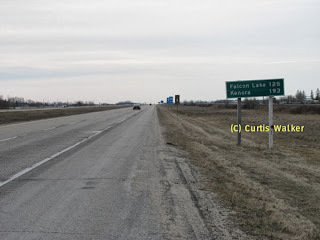 These glaring errors on this three or four-foot high sign could not possibly be any more obvious, yet no one with Signal Industries in Dauphin, where these signs are made, or Infrastructure and Transportation caught them. This sign clearly should never have left the factory, let alone been put up on the side of a highway. I can’t even hazard a guess as to how many people saw this sign on its way here and failed to notice the mistakes. Worse still, this sign stood there for over a year until it was finally corrected this summer. Today, as part of a 41-mile bike ride out that way, I visited the location and got a picture of the corrected sign. Rather than putting a sticker or a metal plate over each letter, which is commonly done on these signs, they repainted it completely. It is akin to repainting an entire wall of a room in your house to cover up a mark the size of a closed fist.